George Boedecker began training in 1955, at age 17. He’s 71 now and still loves to strength train, deciding years ago to get and stay lean and fit rather than massive. And as you see in the photo, he also built a very complete home gym. He has two certifications from the International Sports Sciences Association (ISSA): one as a Certified Fitness Trainer, and the other as a Specialist in Fitness for Older Adults. He is currently studying to get certified as a Specialist in Performance Nutrition by ISSA. George sets yearly strength goals and uses three different training protocols. "I started training with one work set per body part and I still like one hard set to almost failure. "Sometimes I'll do two sets and will not add weight until I can achieve 10-12 reps in both sets. I then add weight and start around 6-8 reps and gradually work the reps up, double progression. "I also really like Escalating Density Training (EDT) by Charles Staley. My last training session was 15 minutes super setting dips and pull-ups using the perfect pull-up device. I then did another 15 minutes for one work set of squats, overhead dumbbell press, push-ups, again using the perfect push-up device, curls, and AB bench sit-ups. I'm finished in 30 minutes total, including warm ups." George also developed the fully-equipped Boedecker home gym and agreed to share information about it. Q. Where on your property is your gym located, and how much space do you have? A. My gym is in a one car oversize garage, about 600 square feet. Q. When did you decide to create a home gym? A. I've had a home gym for as long as I can remember, even when I belonged to other gyms. I was very busy as a sales rep and manager for IBM, so sometimes I only had 30 minutes total to train and having a gym at home made it easier to squeeze in workouts. Q. Do you take all your workouts at the Boedecker home gym, or do you also have a commercial gym membership? A. I have a membership to 24 Hour Fitness. 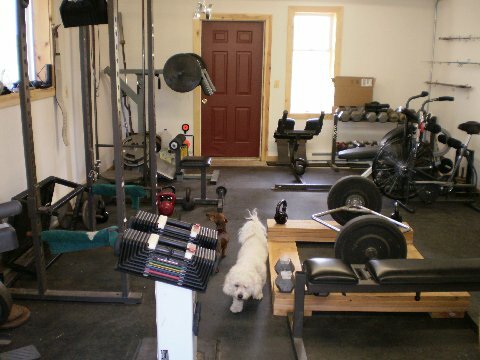 Most of my heavy training is done in my home gym. Q. What was the first piece of equipment that you purchased? A. 150 lb Weider barbell set plus instructions. Q. Can you list all the equipment that you have now? A. Yes, I have . . . Step up platform adjustable from 12-20" high. Q. Is there any single piece of equipment that you consider indispensable? In other words, if you had to select only one piece of equipment for your workouts, what would it be? A. The Power Block dumbbell set that adjusts from 5 lbs to 85 lbs. With them I can do heavy pressing, rowing, curls, triceps curls, step-ups to a bench, and squats. Q. Do you have any training partners who workout with you, or clients who come to your gym? A. I train two young men, ages 19 and 20, and sometimes I train with them. I also train a 55 year-old man, my 44 year-old daughter, granddaughter, and grandson. Mostly though, I train alone. A. Training should be fun, as you know, and I emphasize this to everyone I train with or train by phone. I read over 50 years ago in an article in Strength and Health, by Bob Hoffman, that a person should feel better after the workout than before, and I believe this. I record everything I do and try to make a small gain each session. I also record all the weights and reps of the people I train.